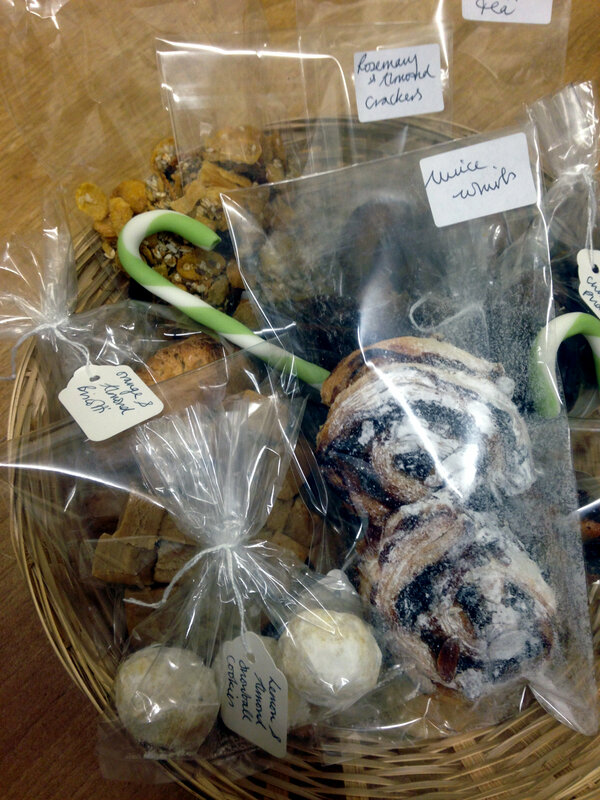 So here it is, after 2 days (and nights) blanked out for a kitchen marathon, I have finally waded through my Christmas baking list and gift baskets are now being put together with the first two reaching their recipients today! If I can, I’d still like to make a stollen and these Coconut-Lemon Meltaways that I’ve had on my list since October. Apologies for any blurry or unattractive photos, my robotic head at 2 am covered in cocoa powder was not in focus, let alone any camera. So here is a round up of the final elements. 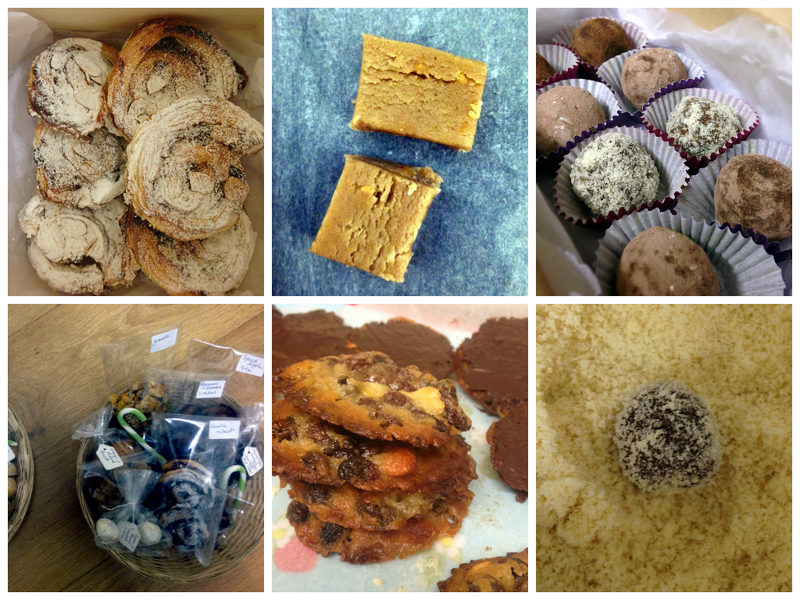 Amaretti cookies, snowball cookies, white and dark chocolate coconut clusters, pumpkin and marmite cat and dog treats, florentines, lemon and sultana biscotti, mince whirls, peanut butter fudge, chestnut truffles, raw Christmas pudding truffles, coconut and cashew filled truffles and some extras for the beauty box – lavender and chamomile pillow spray and grapefruit and poppy seed sugar scrub. 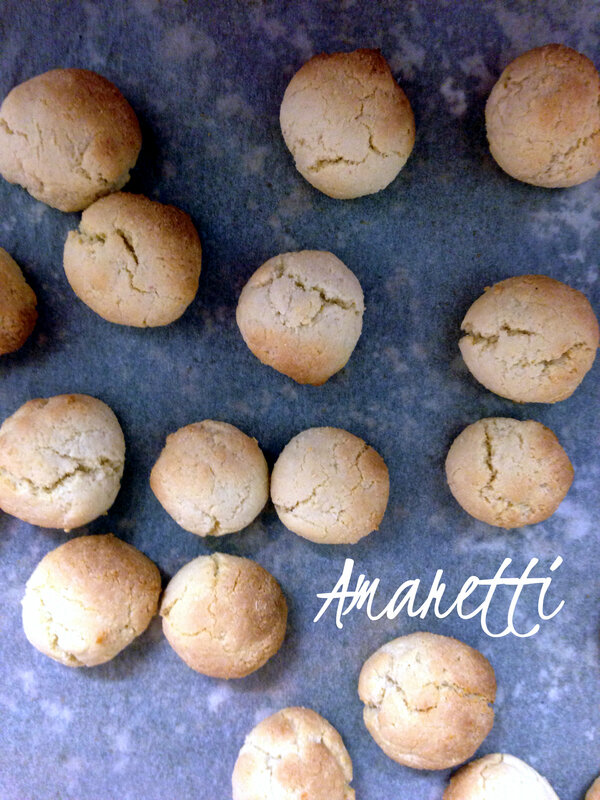 These were just as amaretti should be, crisp and crackled with a chewy, fragrant almond centre. 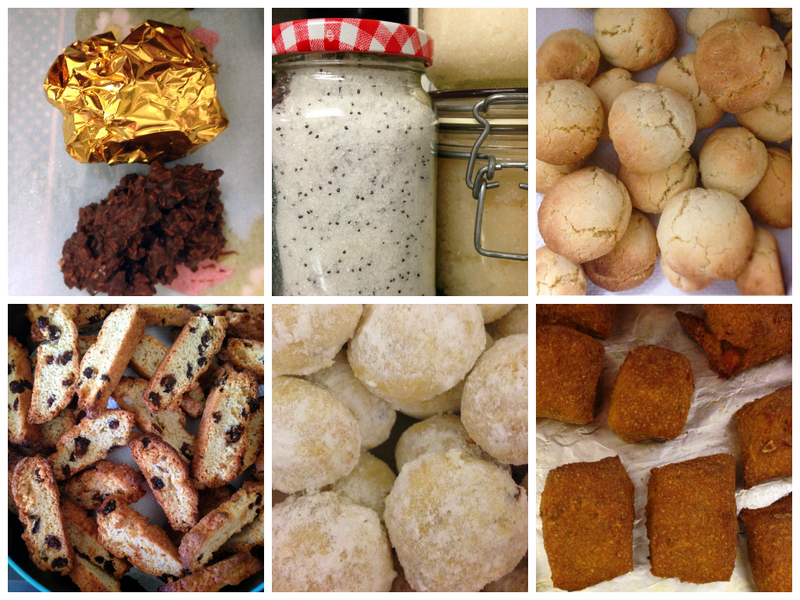 I made the recipe from Holy Cow (minus the vanilla) which made 25 cookies. I found they were ready after just 20 minutes. 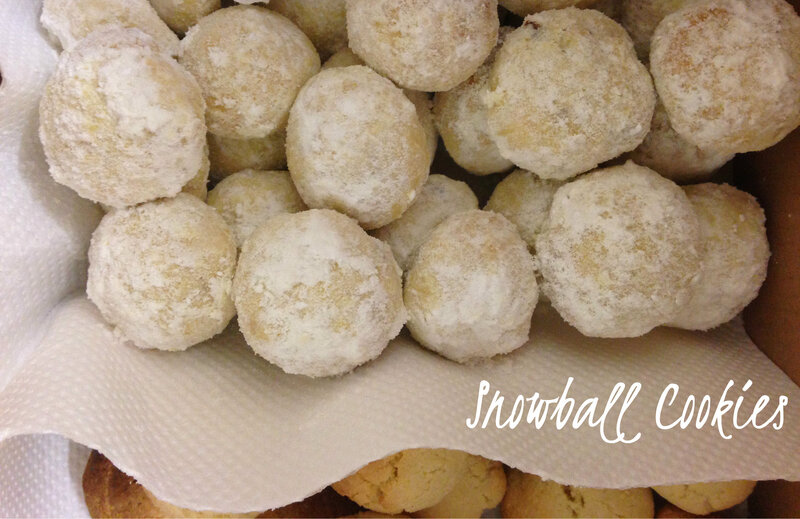 These were the first snowball cookies I had ever made and tasted and they are so light and delicate with a wonderful hint of lemon and nutty crunch. 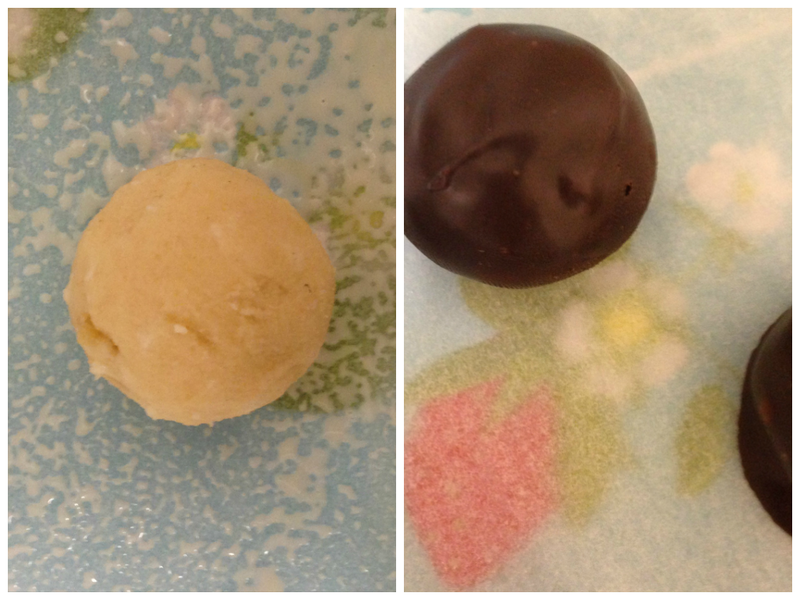 I made these with just almonds and of course dairy free margarine instead of butter. Super quick, simple and snowy gorgeous. Simply melt dairy free chocolate and add half the amount by weight of dried coconut and drop teaspoons of the mixture onto parchment lined trays and allow to set in the fridge. 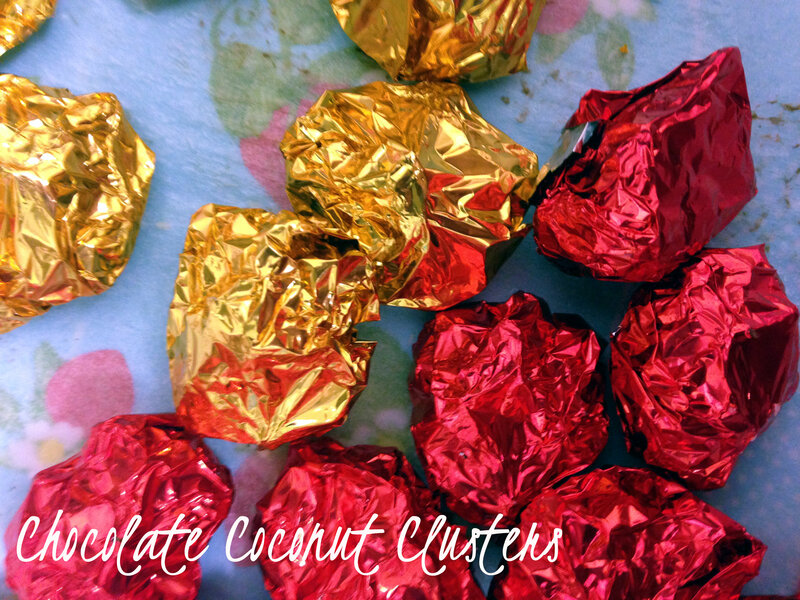 I used dairy free white chocolate and dark chocolate and found that 4oz of chocolate to 2oz of coconut gave about 20 clusters. I wrapped mine in coloured foils, red for dark chocolate and gold for white chocolate. We mustn’t forget to give our furry friends a little treat at Christmas too, but this doesn’t have to be an unhealthy treat. 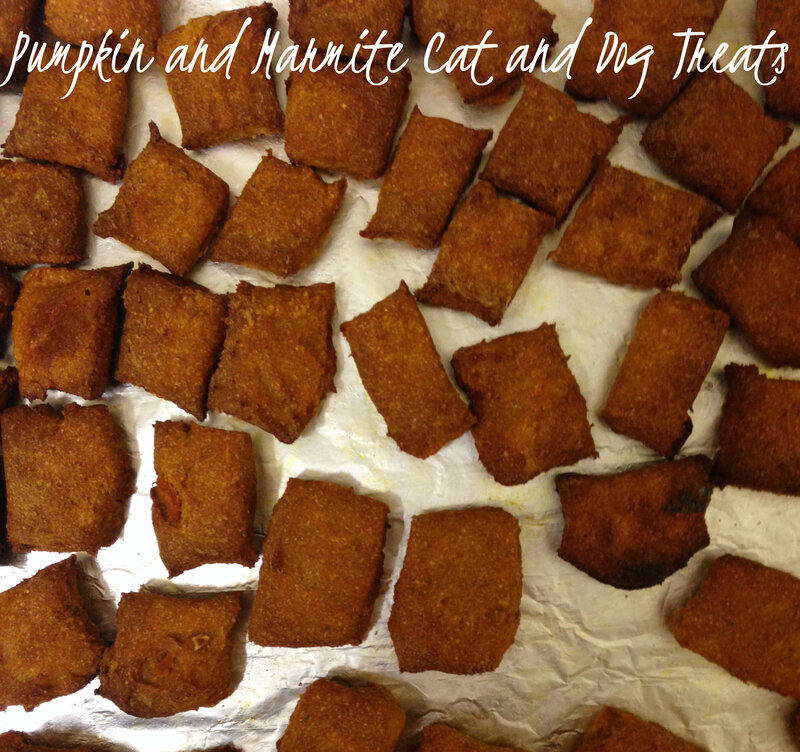 These homemade biscuits are incredibly simple and are full of great healthy ingredients for cats and dogs like pumpkin (great for urinary and digestive health plus the natural oils promote a shiny coat and healthy skin) and reduced salt yeast extract (high in protein, B vitamins and cats and dogs love it!). Adding some herbs like parsley can make the treats more tempting for your pet and also add extra health benefits and nutrition. You can sub the yeast extract for peanut butter if you prefer. Preheat oven to 180’c/350’f and line a baking tray with parchment paper. Mix together 280g whole wheat flour, 225g pumpkin puree, 1 tbsp reduced salt yeast extract and 1 tbsp chopped parsley to form a stiff dough. Press the dough out to about 1/4 inch thick then use a sharp knife or pizza wheel to cut rough rectangles or cut out with cookie cutters. Bake for 20-25 minutes until golden and crisp, leave to cool then store in a breathable container. Adapted from Dog Milk Florentines Another first for me. Oh how I’ve missed out. Adapted and veganized from a ‘Good to Know Recipes’ magazine clipping. Makes 24. Preheat the oven to 180’c/350’f and line a baking tray with parchment paper. Put 100g dairy free margarine, 100g unrefined sugar and 4 tsp agave syrup in a medium pan and melt over a low-medium heat just until the sugar has mostly dissolved. Stir in 100g plain flour, 200g mixed dried fruit and 60g of nuts like almonds or peanuts. Spoon tablespoon sized mounds spaced a few inches apart onto the baking tray. Bake for 8 minutes, remove from the oven and leave on the tray for 5 minutes before moving them or they will fall apart. Transfer to a cooling rack to cool and harden completely. 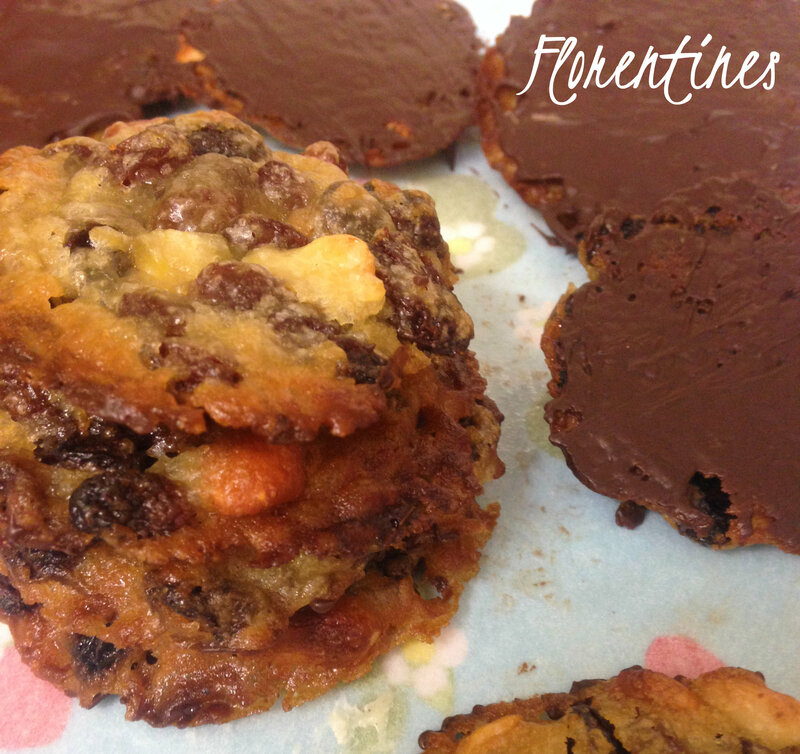 Melt 200g dark non dairy chocolate and use to decorate the cooled florentines. Dip some, drizzle some, paint some.. Leave to set in the fridge. 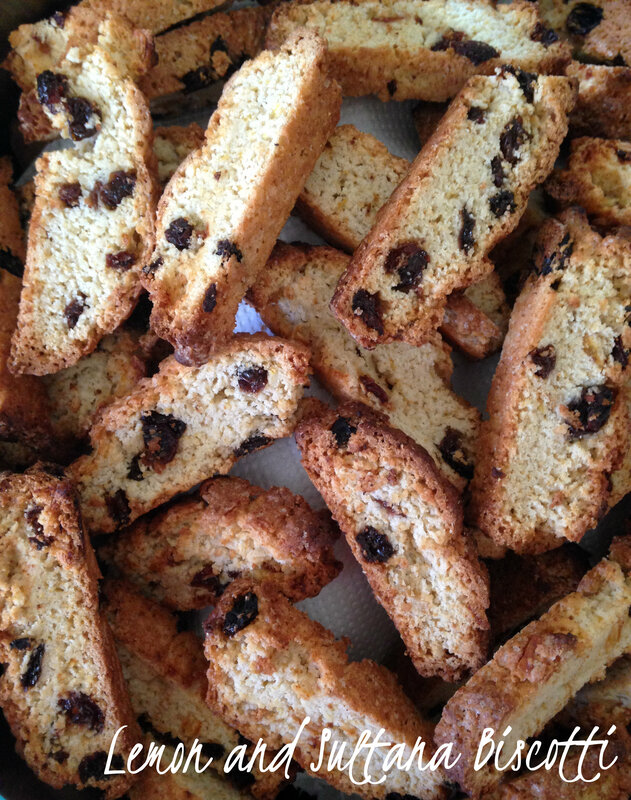 Biscotti is always best with a hint of zest. This recipe is so reliable and adaptable. I left out the nuts and subbed 1/2 cup sultanas for the chocolate chips, added the zest of a lemon and the juice topped up with the non dairy milk. Just be sure to tuck the sultanas into the dough as any exposed fruit will burn and turn bitter, but any strays are easy to pick off once baked! A more fun and super quick and simple version of a classic fruit mince pie. 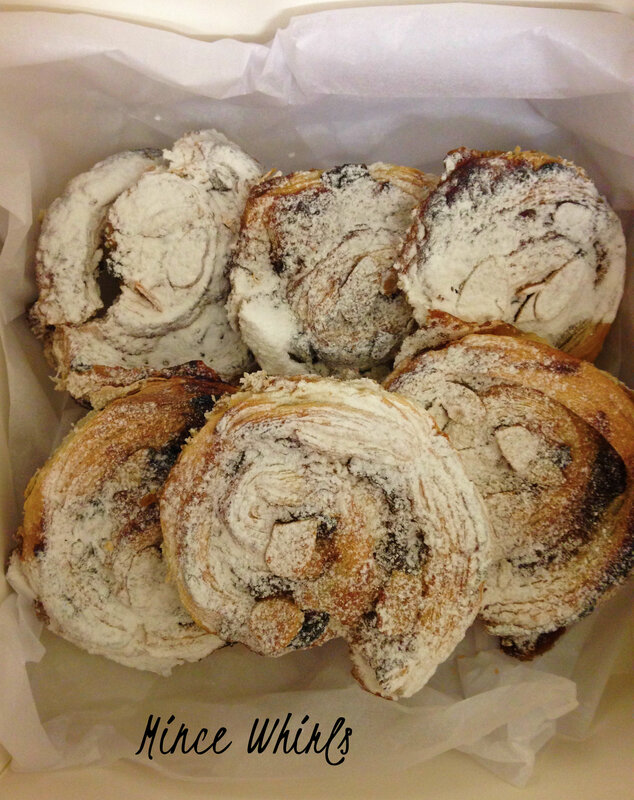 Simply spread a sheet of ready rolled vegan puff pastry (around 320g) with a 400g jar of vegan fruit mincemeat. Roll up from a long edge like a swiss roll, not too tight but tight enough to hold it’s shape, then slice with a serrated knife into 1.5 cm thick rounds. Place on a lined baking tray and sprinkle with a few flaked almonds. Bake in an oven preheated to 200’c/400’f for 15-20 minutes until golden and the pastry puffed and crisp. Leave to cool for a few minutes before transferring to a wire rack to cool then dust with golden icing sugar. 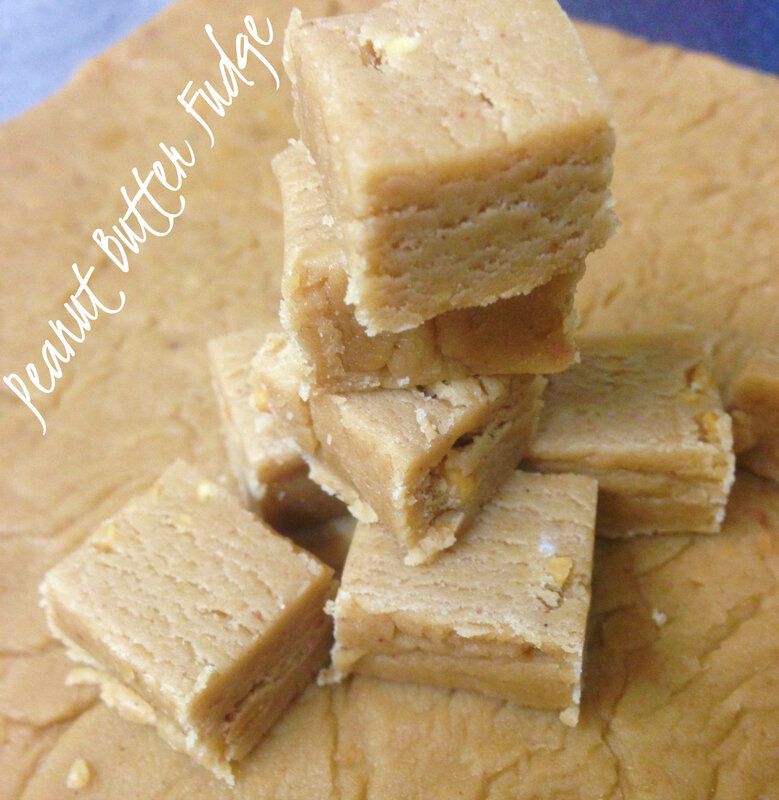 To die for, really easy fudge with the perfect texture and the added delicious bonus of being flavoured with peanut butter and with wonderful crunchy nutty pieces. Veganized from Sophie Dahl’s recipe simply by using vegan margarine and soya milk. Nobody has guessed so far. 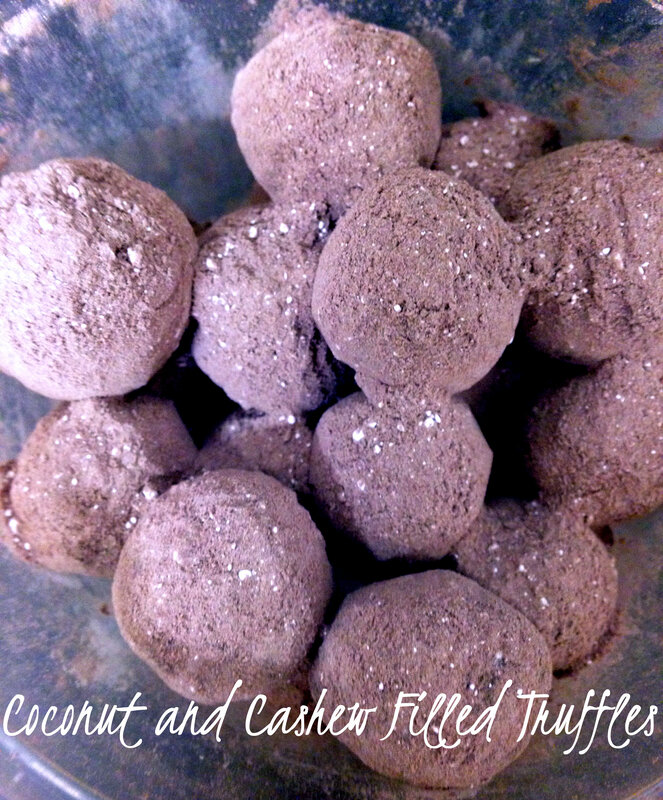 These truffles are creamy, luxurious and smooth as a truffle should be. Simply melt 400g dark dairy free chocolate then use an electric whisk to mix in to 400g chestnut purée in a large bowl until combined and creamy. 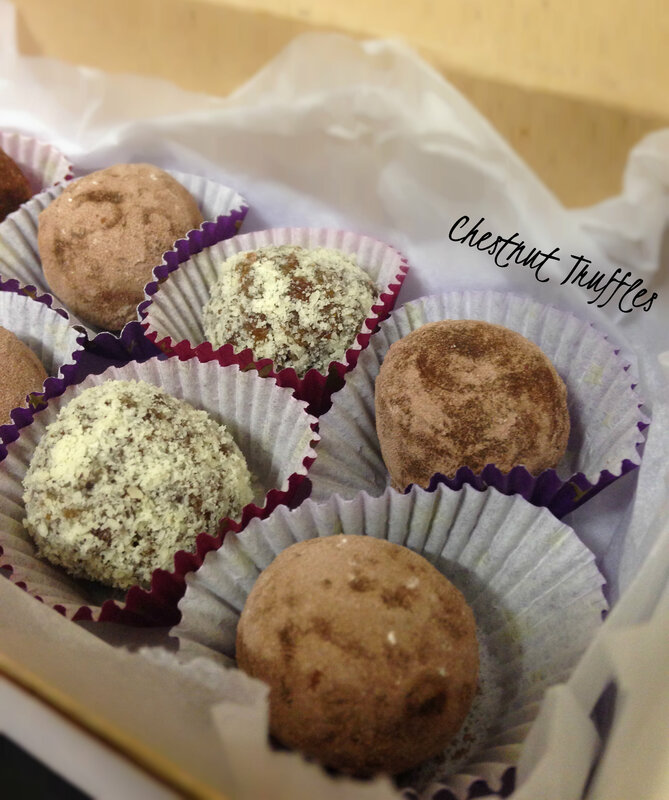 If using unsweetened chestnut purée, you can add 100g powdered sugar to the mix if you like your truffles sweeter. Refrigerate for a couple of hours until firm then roll into teaspoon sized balls and roll in whatever coating you like, cocoa powder, icing sugar, chopped nuts, melted chocolate, cookie crumbs or anything else you like. Makes at least 50 truffles depending on size. 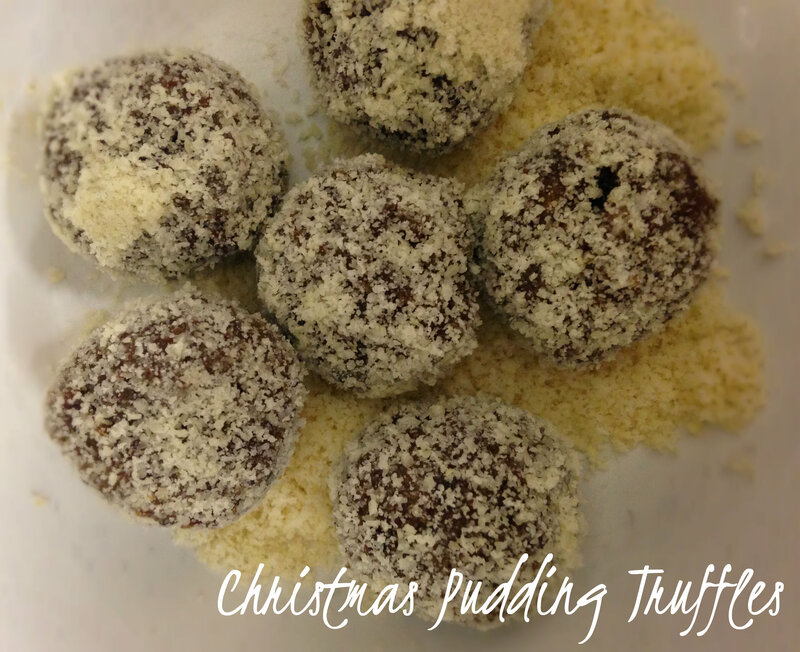 These little morsels are whipped together in minutes in a food processor with all the flavours of Christmas pudding all wrapped up in a little ball coated in ground almonds. One of the quickest treats you can make. Adapted from Delia. Simply add to the bowl of your food processor, 250g dried mixed fruit, 25g ground almonds, the zest of 1 orange, 1 teaspoon mixed spice and 1/2 teaspoon ground cinnamon. 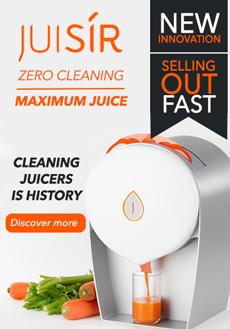 Run the machine until the fruit is finely chopped then add a teaspoon at a time of the juice from the orange, pulsing until the mixture clumps together. Refrigerate for at least 30 minutes before rolling into teaspoon sized balls and rolling in extra ground almonds. Makes 25-30. These wonders came about after I had leftover soya condensed milk sitting in the fridge. 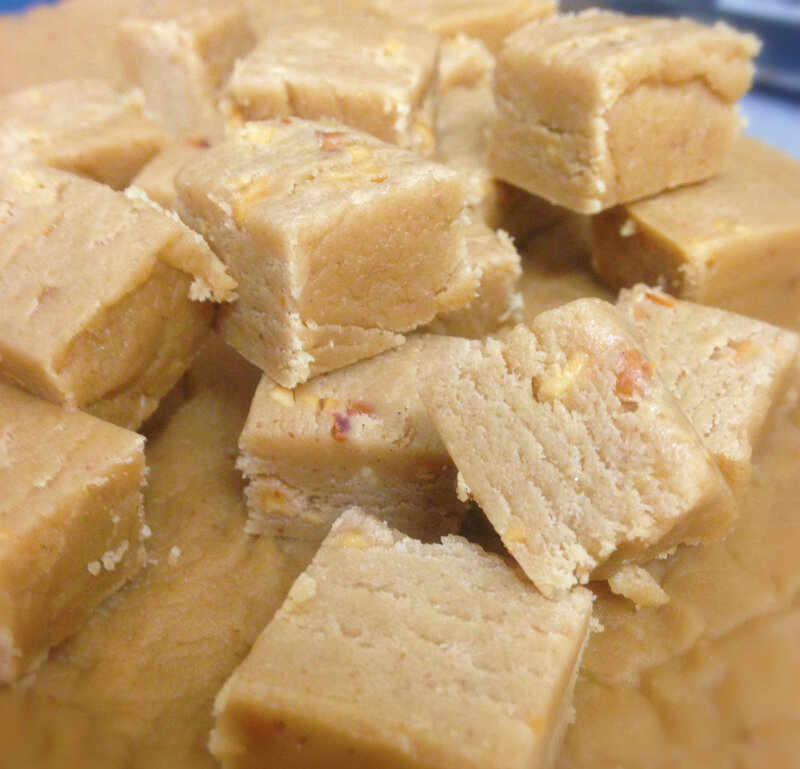 I decided to experiment with it by adding coconut to make a fudge like consistency. Crushed cashews add a welcome bit of texture to the fondant like filing which was then dipped in chocolate and some then also dipped in cocoa and powdered sugar for en extra chocolatey hit. Simply mix together 1/2 can (115g) of soya condensed milk, 3 tablespoons of desiccated coconut, 3 tablespoons of coconut flour and a handful of roughly chopped or crushed cashew nuts. 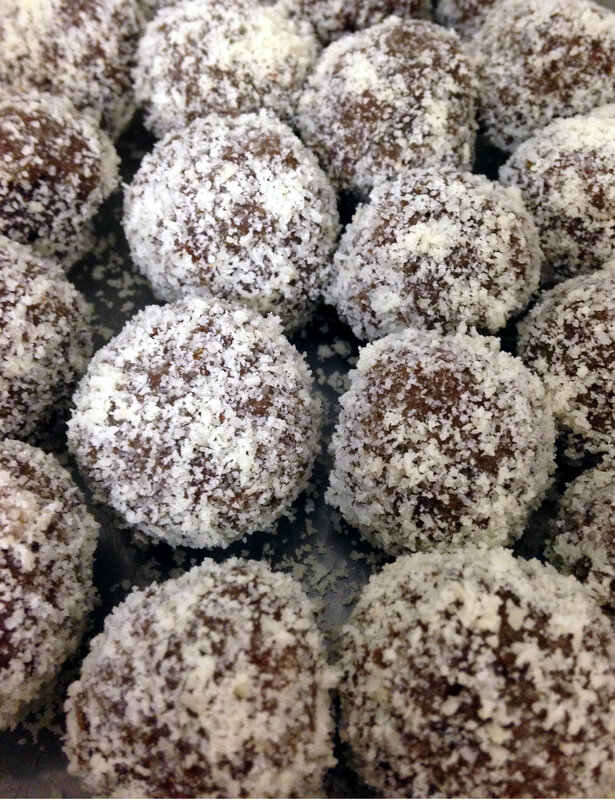 Freeze until firm then roll into balls, dip in melted chocolate, leave to set then if you wish, roll some in a mix of cocoa and golden powdered sugar. 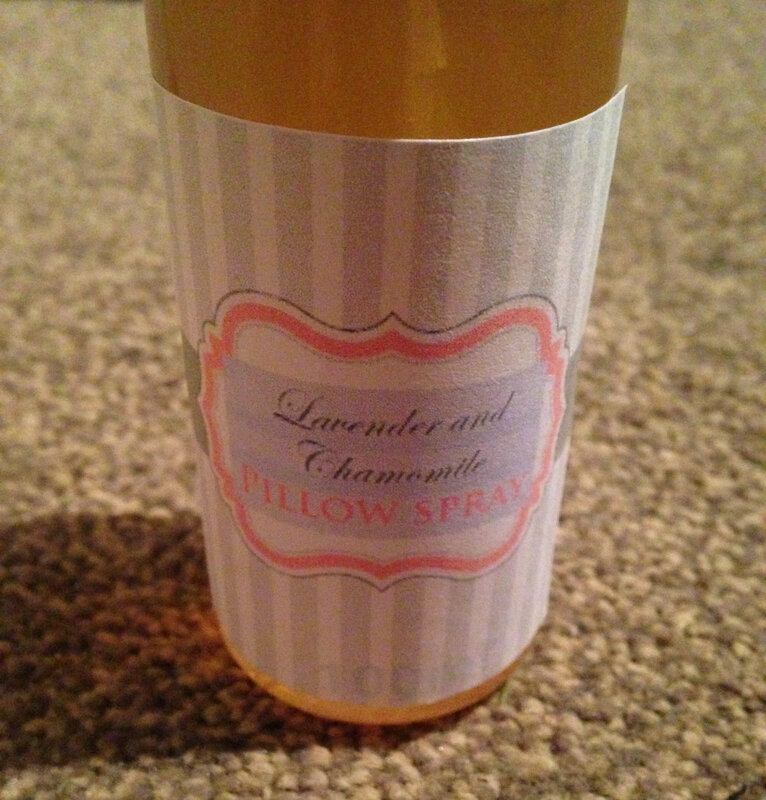 Give the gift of restful sleep with this simple pillow spray that is simply made of cooled chamomile tea and lavender essential oil. 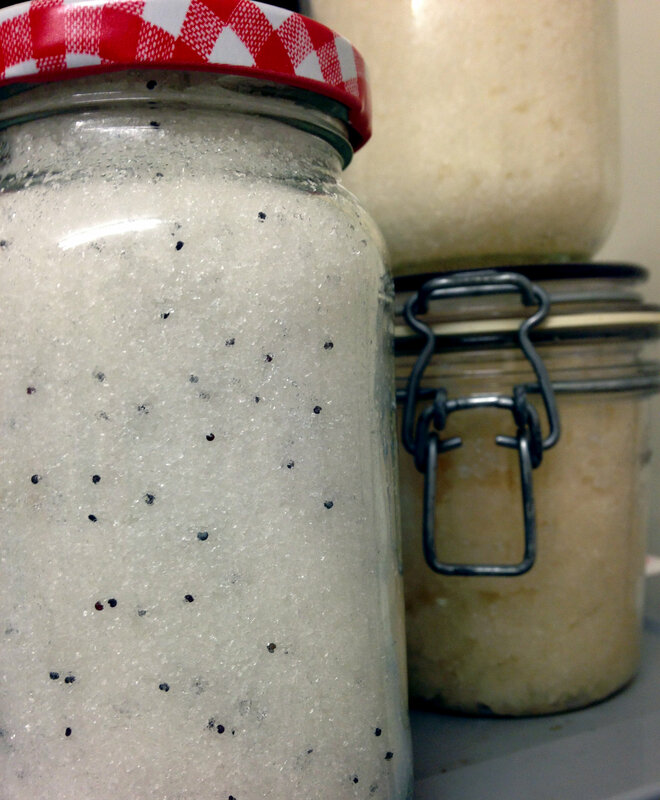 This super exfoliating and pretty polka dot sugar scrub can be mixed up in minutes. 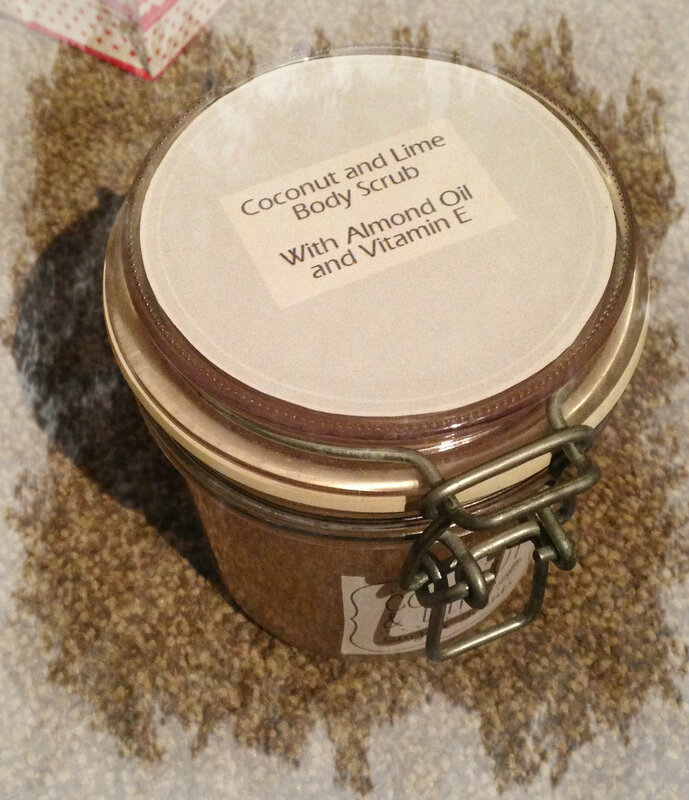 Per cup of scrub, mix together 60ml/1/4 cup almond oil, 200g/1 cup granulated sugar, 1 tablespoon poppy seeds and a few drops of vitamin e oil (optional) then stir in 8 drops of grapefruit essential oil. Lemon would also work well here. 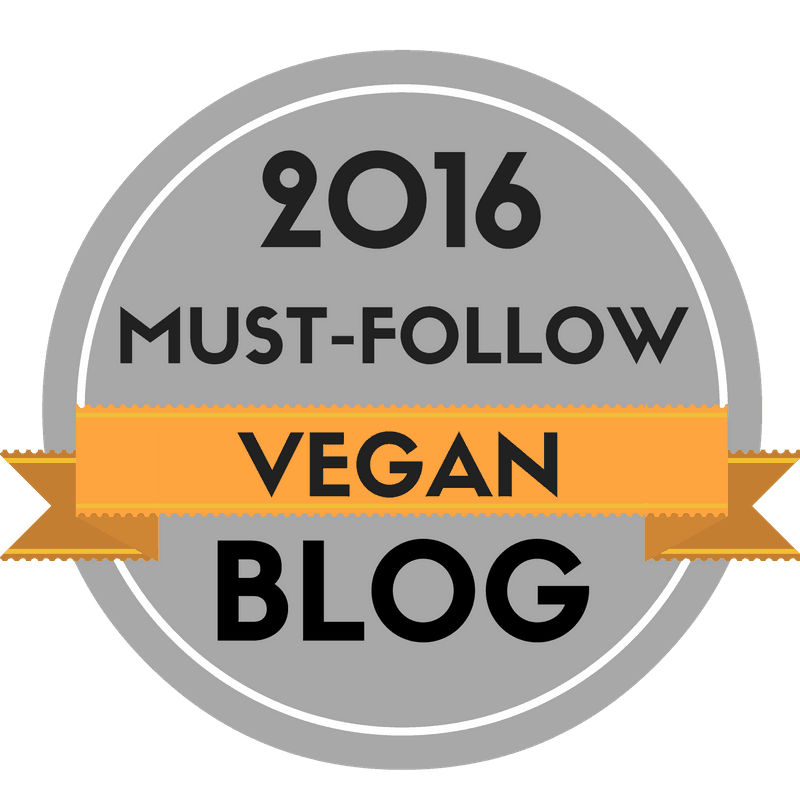 This entry was posted in Chocolate, Christmas, Gifts, vegan, Vegetarian and tagged baking, CHRISTMAS, dairy free, DIY, egg-free, food, food gifts, vegan, vegetarian. Bookmark the permalink. Amazing! Your friends and family must really love receiving such thoughtful, homemade gifts. I hope they do!! I certainly really love giving them! Merry Christmas! Lovely idea! 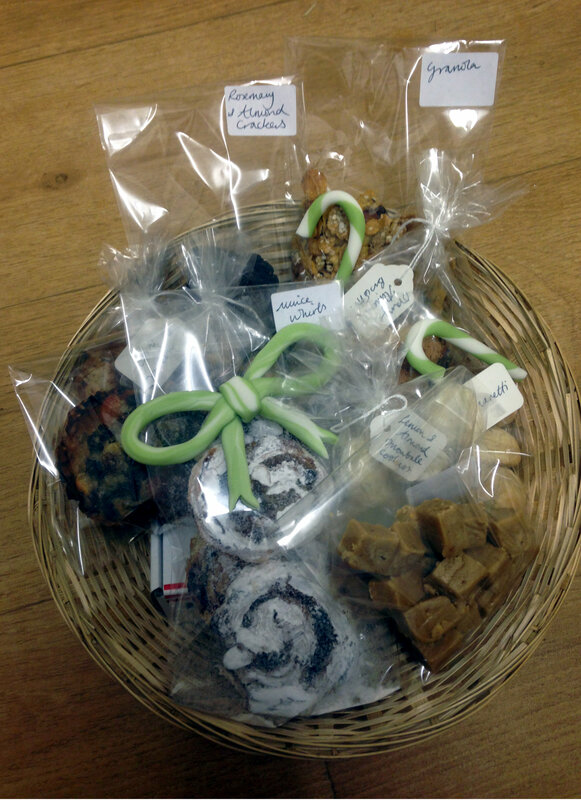 How lucky are the recipients of your baskets! Oh no, really? Whereabouts are you? How wonderful, thank you so much! ok Poppy, admit it- you’re an octopus and not a human being. If you’re actually human, I will feel like a sloth for the rest of my life! All animals aside, everything looks beautiful & yummy. You are so talented, creative, motivated and so giving- your friends are ridiculously lucky. I’m lost for words – how to respond to that gorgeous message? I’ll start by confirming that I am human!!! Although it would be cool if I was an octopus! I’m so pleased that I can inspire people, it’s the reason I’m here after all. Thank you for such kind, supportive words. I hope you are having a wonderful Christmas time. 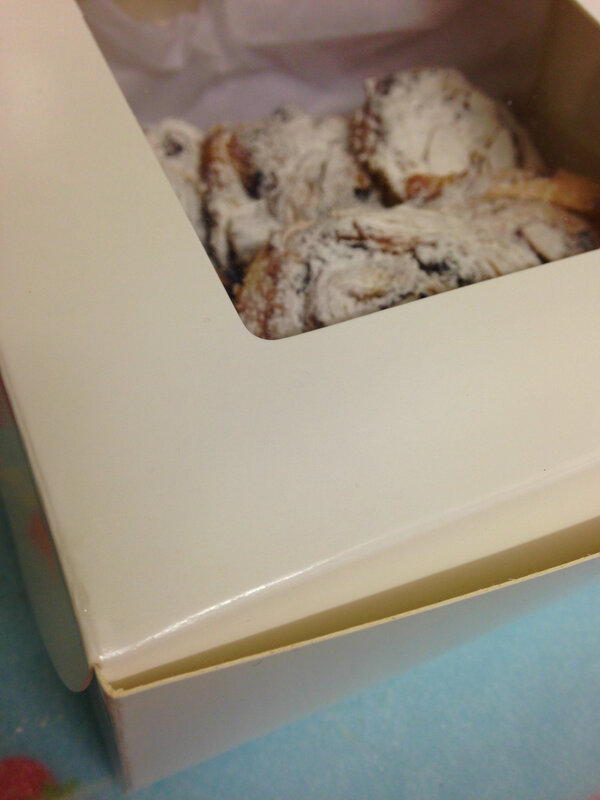 You’re so sweet – you are amazing! Hope you are having a great Christmas! Bea-u-ti-ful photos!! They all look so good! How kind of you Emory. Thank you. Wow! So much time, thought and love went to all this! Great work, this is truly inspiring! Marry Christmas! These look incredible. I’m so jealous of your friends and family! 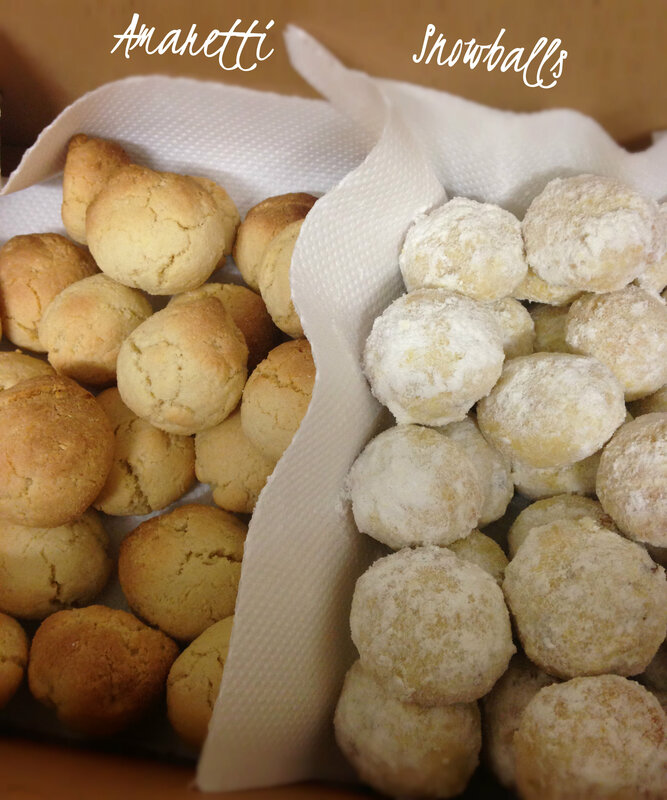 The amaretti cookies are calling my name! I usually buy them at the local Italian market and put them in my Christmas rocky road. I can’t wait to bake ’em now! 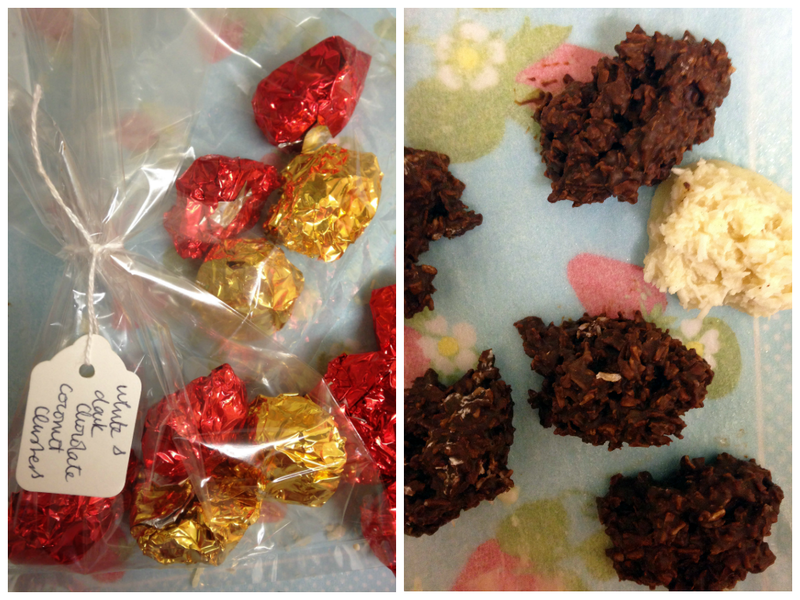 Oh amaretti in rocky road sounds to die for, I shall be trying that – thank you! How sweet of you to say Violet, thank you so much! 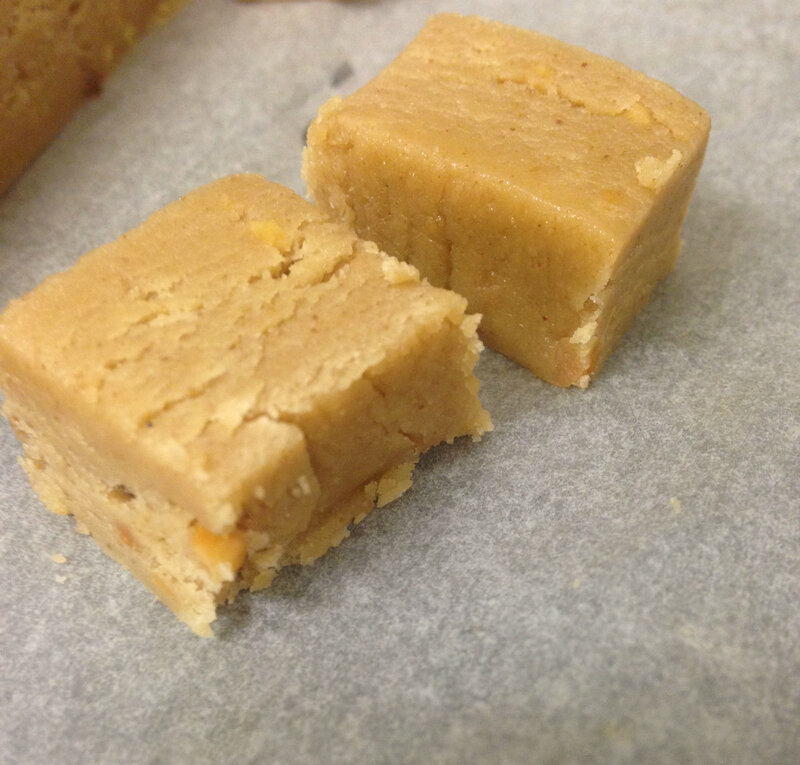 How could I have not known of peanut butter fudge? I am at a loss for words… Everything looks amazing! Incredible! Bravo! What you have done are the best kinds of gifts. Merry Christmas Poppy! How wonderful of you – thank you so much! Best gifts for Christmas Fest!!! Thank you Deena! Merry Christmas!